I'm exhausted. After around two hours of paranoia and bloody struggles, I need a stiff drink. Hell, I need two. 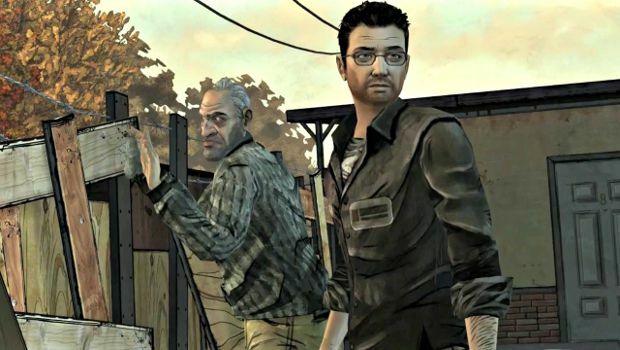 Back in April, I said this of the first Walking Dead episode: "Telltale has managed to plant the seeds of emotional connection; which I can only hope leads to more intense drama and difficult decisions." I can tell you right now that it has. More than I expected. With introductions to the survivors and the game mechanics firmly behind us in A New Day, Telltale now seems content to mess with us and, indeed, the survivors even more. What makes Starved for Help such a harrowing, but fantastic, experience? Well it all starts with hunting for food. 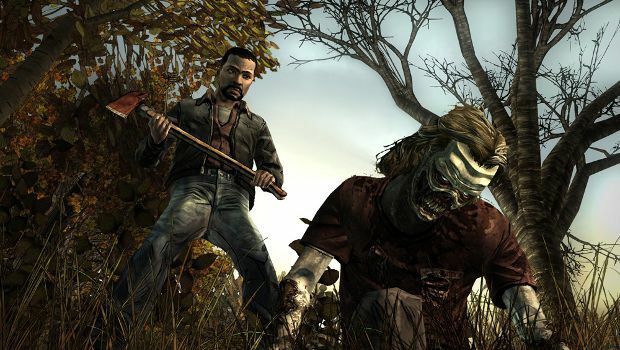 As I guided Lee Everett's axe into the skull of a clueless zombie, hunkered down between trees in the woods, I was reminded of just how brutal this series has been so far. Things were a little different now, however. The survivors of the Macon pharmacy have been holed up in the motor inn for three months, quarter of a year surrounded by the walking dead. Lee was getting used to all the killing. The rag tag group of survivors has gained a new member, Mark, who provided them with enough food to last them a while. 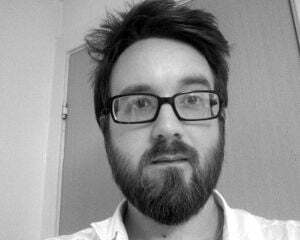 It's all gone now, though, hence the hunting expedition. Unfortunately, the walkers have been gobbling every living thing in the woods. 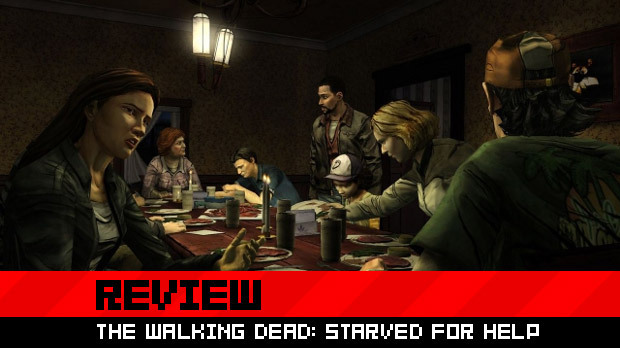 As the group continues to grow and food becomes more scarce the relationships between the survivors become tense and significantly more troubling than the animated corpses that plague them. Lily and Kenny have been in a tug of war over the group's leadership for awhile, and both look to Lee for support. It continues to be very interesting to be put in the role of just another member of the group, rather than the leader. However, events keep pushing Lee to the forefront, forcing him to make decisions that affect everyone, and that can be bloody tough. There aren't right or wrong choices, it's all about sacrifice and trying -- but usually failing -- to keep the group strong and together. In the whole two-hour experience, I only made one choice I didn't regret at all, one choice where I think I did the right thing, even if others would disagree. After getting in an argument with Lily about rationing, Lee is given the unenviable task of doling out the last of the food. Four measly snacks. People would have to go without. The kids Duck and Clementine were obvious choices, but what about the last two pieces of food? You can even save a piece for yourself, though honestly you'd have to be a special kind of arse-hole to do that. 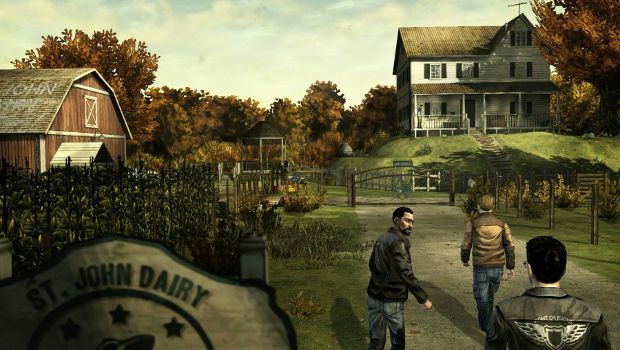 When the survivors meet two gents from a nearby dairy farm, things start to look up. It's an idyllic place, with corn fields, pastures, verdant farm land as far as the eye can see under bright blue skies. The moment I saw it I knew we were in trouble. Everything is trouble. Every conversation is like walking a tightrope, every dialogue option feels like something I needed to think about, but had no time to. Did I give away to much information? Why is he asking all these questions? Did he notice I deflected them? There aren't really many puzzles in Starved for Help, but dialogue is a conundrum, a wonderful, nerve-wracking conundrum. Not only is Lee tormented by the decisions he must make in the present, he's constantly reminded of the ones he made in the past. His history as an apparent murderer, as well as the choices made in the first episode haunt him. The way these things are brought up in the heat of the moment, during arguments or moments of stress and anguish makes it feel all the more organic, even though the mechanic is exceptionally obvious if you peek behind the curtain for a second. It's a brilliant illusion, and one used sparingly. The closing moments of the game present players with the final moral dilemma. Had the situation been used at any other part of the game, I don't think I would have given it much thought, but after the distressing second half -- which goes by pretty damn fast -- it weighed heavily on me. Essentially it boiled down to potentially screwing people, possibly innocent people, over just for a few supplies. Throughout most of the episode, and the previous one, I'd been making choices that I thought a good person would make. This time I said to hell with it. The look Clementine gives Lee makes me wonder if I made the right choice. Clementine continues to be a rare thing in videogames, a kid that isn't incredibly annoying. Normally I would have fed her to the zombies, but most of the decisions I made in Starved for Help were informed by how I could make things easier for her. Including this situation. She might not agree with Lee's actions, but she needed to eat; they all needed to eat. The minor bugs and glitches that hampered A New Day are not repeated in Starved for Help. There are no stupid moments that make no sense like the "battery incident" in the pharmacy, either. In fact, Lee actually playfully mocks Carley for her earlier stupidity. In every conceivable way, this episode improves on the last. The controls could do with a bit of work and I still think that vastly increased challenge either through puzzles or conflict would more appropriately match the tone of the game, but all of these are things I thought after I was done with it. None of them got in the way of the experience. With that said, I'm going to hunt down some whisky.